In celebration of Mario‘s 25th year in the industry (and making Nintendo some oodles of cash), Nintendo is releasing a new Wii variant in (what else?) Mario Red. The console will be out in Japan on November 11 with a price tag of ¥20,000 (USD$240 / Php 10,500). 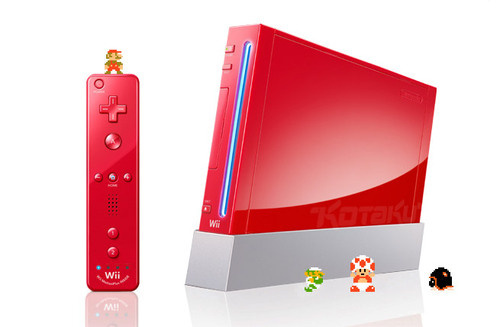 Like the Black Wii before it, the Mario Red Wii will ship with a Wiimote and a MotionPlus add-on. Nintendo says the individual red Wiimotes will go on sale on the same day. Because it’s Mario’s 25th anniversary, Nintendo packs a copy of Super Mario Bros. (the old game) pre-installed on the system.